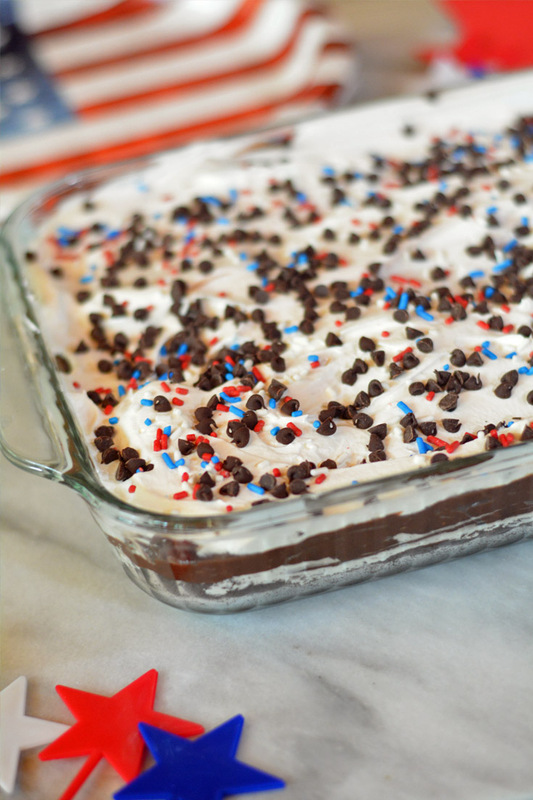 Red ,White, Blue chocolate lasagna is an easy summer dessert. 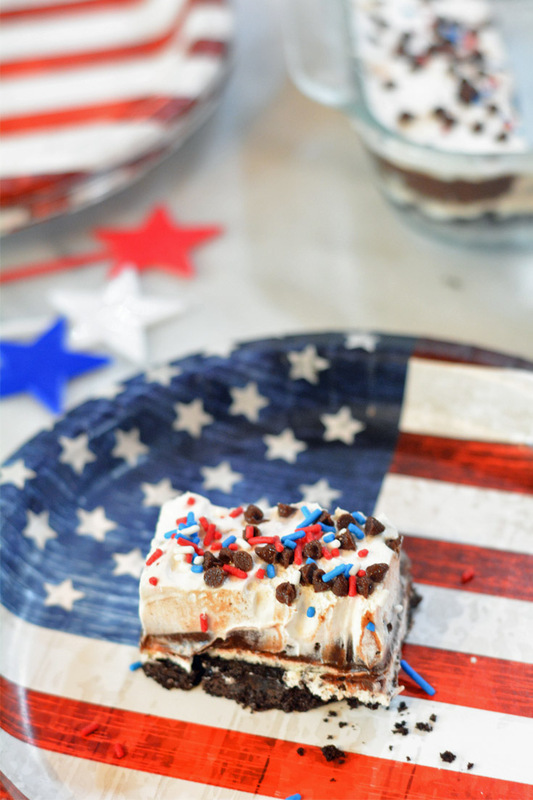 This no bake dessert is one of our most popular desserts and is an easy patriotic dessert for Memorial Day, 4th of July or Labor Day. Friends and family always rave over this Chocolate Lasagna recipe. It is one of the most popular desserts when it comes to family parties and barbecues, and it’s super easy to make. You don’t need to be baker as this chocolate dessert is no-bake, and you don’t needany fancy pans, just a casserole, glass dish or 13×9 baking dish. You can easily swap out the sprinkles to fit into any party theme. Almost every time I make it someone requests the recipe. Crush 1 package of regular Oreos until fine. Food processor works best & is the quickest, or place them all in a ziplock bag and crush. Dump Oreo crumbs to a large bowl. Mix in 6 tablespoons melted butter. Mix the cream cheese with a mixer until light and fluffy. Add in 2 Tbsp milk and sugar, mix well. Stir in 1 1/4 cup Cool Whip. Spread this mixture over the crust. In a bowl, whisk together chocolate instant pudding with 3 1/4 cups cold milk until pudding thickens. Use a spatula to spread the mixture evenly over the cream cheese layer. 2 3.9 oz Chocolate Instant Pudding. Crush 1 package of regular Oreos until fine. Food processor works best, or place them all in a ziplock bag and crush. Spread the remaining Cool Whip over the top. 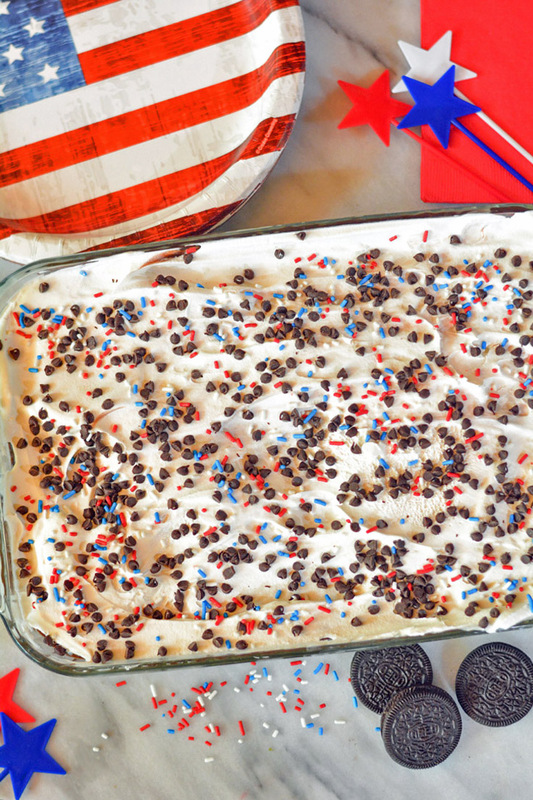 Sprinkle with mini chocolate chips & patriotic sprinkles. Oh my, that looks yummy! And patriotic! I’m printing out the recipe now. 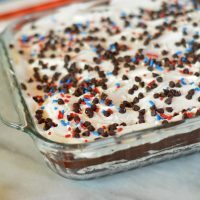 i love a no bake dessert in the summer. Perfect for the 4th of july cookout! I saved in pinterest and am sharing with my sister as well. Love the easier recipes that I can try for my kids. I’m glad I found this just in time for the 4th!